Halloween is that one time of the year when purple and orange seem to be a perfect match. How fun is that? 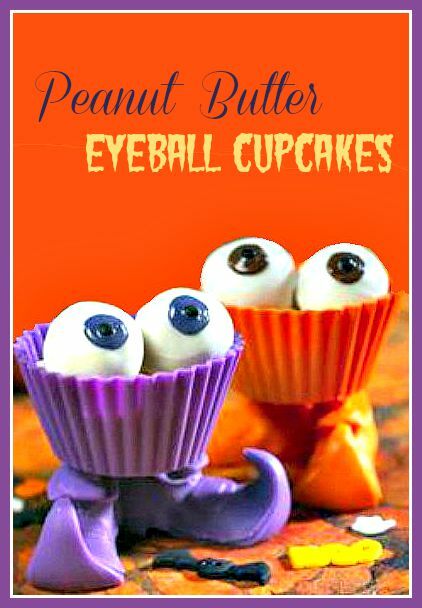 What a delight these peanut butter eyeballs would be on your Halloween table. Now, if you read my blogs regularly, you will know that I have a fondness for peanut butter. As in, it’s a food group. “nuff said! So eyeballs made of peanut butter? Perfect choice for me. No need to see what else is in there. It’s gotta be good! My favorite part of the treats are the piped jester styled feet. The treats are colorful and will delight both the young and the young at heart. 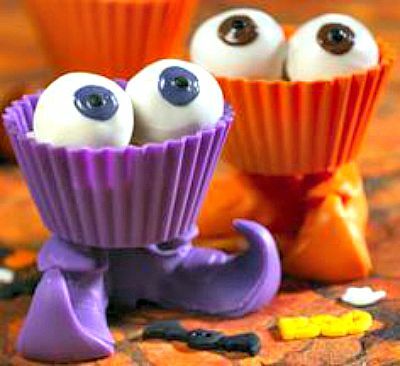 If you wanted to take a shortcut and not make your own chocolate cupcake liners, you could use colorful silicone cupcake liners and fill them with regular cupcake mix and just make the eyeballs and feet. Either way, they will be the perfect dessert touch for your Halloween party table. And if you are looking for some budget friendly tips to make your Halloween party a great success, see this article on my main blog, The Gardening Cook. Now the question is? Who will take the first bite? This recipe has been shared from Parents Connect which has now closed. Combine the butter, powdered sugar and peanut butter in the bowl and mix on low speed until well combined. Add in the toasted rice cereal. Form into ½-ounce balls and refrigerate until firm (about one hour). Place the white chocolate in a microwave-safe bowl. Melt, adding vegetable oil mid way through the process. Stir until smooth. Dip the balls into the melted white chocolate mix. Make sure they are well coated. Remove and set on a waxed paper lined sheet pan. Chill to set up about 30 minutes. Separate the remaining white chocolate into two bowls. Add one to two drops of food coloring to each to tint each bowl a different color. Reheat if necessary. Use a small spoon to place a dollop of the colored chocolate on the eyeball. Use a smaller drop of the contrasting color in the center. Line aluminum cupcake liners with the colored chocolate. Place in fridge to set. Remove the aluminum carefully to leave colored cupcake shapes. Place balls in individual mini muffin papers. Use a large icing tip and form feet under the cupcake liners with the colored chocolate.